So, at this point, climate change is pretty much going to totally overhaul the world as we know it. How, exactly, and when, are matters of great speculation. Sea levels and temperatures will be higher, some regions will see more precipitation, others will grow more arid. Depending on how quickly we wise up, all of the above could lead to a much nastier, much less inhabitable world. 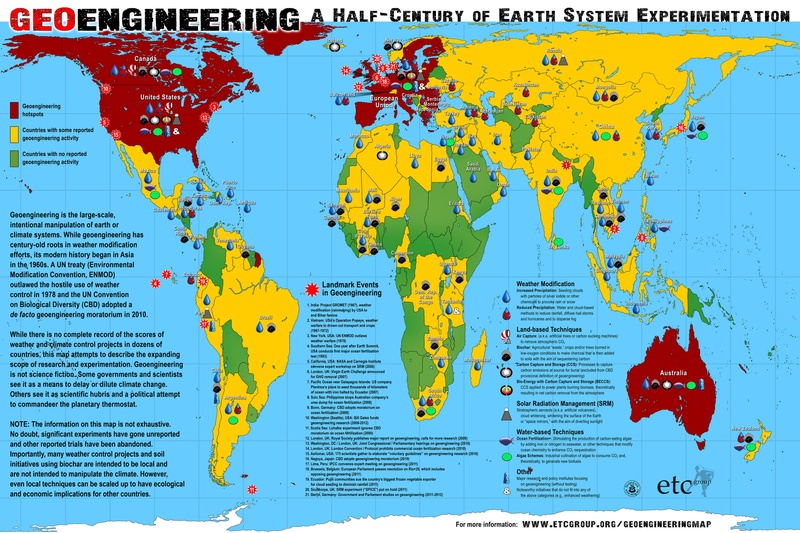 Which brings us to geoengineering. With faith in international diplomacy at an all-time low, and efforts to arrive at a global framework for combatting climate change having crashed and burned, we're hearing more and more talk about geoengineering solutions—techno-fixes like ocean fertilization or cloud-seeding that proponents argue could help 'engineer' the climate to correct for the abundance of CO2 we've dumped into the atmosphere. Justifiably, many argue that we shouldn't mess around with such risky and unintended consequence-generating endeavors. But according to ETC, many nations around the globe already are. Above is a map of all the geonengineering projects underway around the globe—head over to ETC for more details on who's mucking with what. The quest to find a last-ditch techno-fix for climate change is more intense and globe-spanning than you possibly could have imagined. See for yourself.